That’s what HSG stands for, right? If you hadn’t already figured it out, I had an HSG (which actually stands for HysteroSalpingoGram – test to determine whether the fallopian tubes are open and to look for any abnormalities in your uterus) yesterday. I’m not sure where I left off, but this all came about because I asked my RE’s office if they could please look into submitting for prior authorization for future fertility treatments now that I have had 6 failed IUI cycles. I live in Massachusetts, and fertility coverage is required here. Which is amazing. But I am also a lesbian. My particular insurance carrier (Blue Cross Blue Shield MA) requires that lesbians (well, they call it “those whose infertility is due to lack of exposure to sperm”) have 12 physician-monitored IUI cycles that don’t result in a live birth before they will allow the “infertility” label (and therefore insurance coverage) to be applied. Literally all of the other insurance carriers in the area require 6 cycles. So that’s a bummer for me. I have done 6 cycles, but I also have PCOS which comes with anovulatory cycles and prolonged periods of amenorrhea. Long story short, my RE’s office was able to get the prior authorization for funding for my future treatments (IUI and then IVF if necessary) based on anovulation without meds and 6 ovulatory cycles in the past year – which is just amazing. I had inquired about an HSG 2 cycles ago, but was told it wouldn’t be funded for me and that it would cost around $1000. Since my RE didn’t think I was at risk, I didn’t go for it. Now that I can hopefully move forward with insurance funding, my insurance requires the HSG, so it was scheduled. I went in yesterday after reading terrifying but also not-so-terrifying stories online. I was trying to be prepared for the worst and was so so nervous. I did everything they said (started an antibiotic on Wednesdays, took pain killers about an hour before my procedure), and headed in with Em to get it over with. I wish I had known that she wouldn’t be allowed in! The doctor used a speculum and cleaned my cervix with antiseptic (not comfortable) before inserting the catheter through my cervix and into my uterus. This portion of the HSG essentially felt like an IUI. Once the catheter was in, she removed the speculum and had me lie down/positioned me for the x-ray. The nurse had said they would let me know when the dye was about to go in but they totally did not which I didn’t appreciate. Then I suddenly felt cold liquid gushing down my leg and heard the doctor wondering aloud whether the catheter had moved. 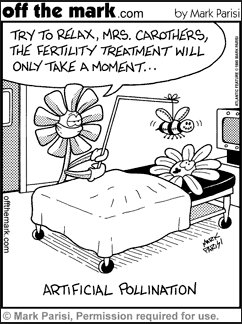 It obviously had, so in came the speculum again – hooray. Apparently the second placement was successful, because once they got me repositioned I suddenly felt the sensation of liquid going into my uterus, and then pain akin to severe menstrual cramps (the kind that have you curled in a ball on the floor) which got more and more painful as the dye was pushed in. The pain was rough, but not unbearable. I was almost at the point where I would yell out in pain, but not quite there. It lasted about 2 minutes. Afterward I had quite a bit more dye on me than the average HSG-er would because of the initial catheter issue. That stuff is sticky and gross. I had some mild-moderate cramping and a bit of nausea immediately after the procedure and for about 2 hours, but then felt better. I had a little bit of bleeding/dye/discharge yesterday and even less (more like spotting) today. The result? My uterus has a “nice triangular shape” and they didn’t see any abnormalities. My right fallopian tube was open and they saw spillage right away. My left tube didn’t show spillage right away, so they pushed dye again and then they were able to see it. In the end, both tubes are open and my uterus looks good! I only know the info about the left tube from overhearing them during the procedure (she didn’t report it with my results), so it is my assumption that there was a bit of gunk there that was cleared out by the test. I’m hopeful that my newly clean lady parts are ready for action this month! Quick update on this month’s TTC plans: I took Letrozole days 3-7 and my first monitoring appointment is on Sunday (CD11). I am hopeful and excited about this cycle, and ready for IUI #7 next week. Sorry for the boring/tl;dr post. Note to self: this is what happens when you wait too long to blog. Anyone out there with a post-HSG IUI success story? Posted in Baby making curve balls, The waiting game and tagged fertility, hsg, hysterosalpingogram, infertility, lesbian TTC, PCOS, TTC. Bookmark the permalink. Today is CD 13 and I had another follicle scan to see how things are going during this letrozole cycle. The follicles on my right ovary (previously 10mm and 11mm) are falling away. I had just 1 at 10mm on the right today. My left ovary is taking charge – I had 1 at 12mm and 1 at 15mm today. Hopefully things are ramping up. I haven’t gotten a call back from the nurse, so I don’t know when they’ll have me back in. I suspect it’ll be Sunday or Monday though, and am hoping for an IUI early next week. I’m also very aware that at this point in my last cycle (Clomid cycle #2) I got excited only to find out my lead follicle decided to shrink, and I ended up with a 54 day anovulatory cycle. So I guess I’m cautiously optimistic. Posted in The waiting game and tagged femara, fertility, follicle growth, follicle scan, follicles, infertility, lesbian TTC, letrozole, PCOS, trying to conceive, TTC, ultrasound monitoring. Bookmark the permalink.